The other day we were in Lotus and Marvin saw a very strange kind of fruit with big spikes on the outside. He said that he didn’t like the smell very much but he wanted to know what it was. I told him that it was called “durian” and it was a very special kind of fruit and that it was also very expensive. Some Thai people even call it the “King of Fruits”. Marvin much preferred, however, the mangosteens, which are the fruit that is purple on the outside but have a yummy white bit in the middle. This fruit is known in Thailand as the “Queen of Fruits”. 1) Why is a snake careless? 2) What did the mother sardine say to her children as the submarine went by? 3) What kind of bow can’t be tied? 4) Which word has ‘he’ at the beginning and at the end? On May 8 after placing first in the Northern Thai Region, Prem student Vorarit (Art) Treyanurak traveled to Bangkok to compete in the final round of the “Yamaha Music Festival 2004” on the classical guitar. Though Art has only been studying the guitar for just under two years now, he placed second in the nation in the 16 and under age category. 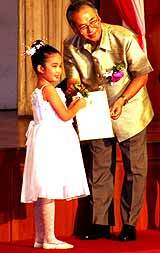 In Bangkok, Art was awarded the Shield of Honor from H.E. General Pijit Gulavanit and 8,000 baht in prize money. Prem student Vorarit (Art) Treyanurak placed second in the nation in the 16 and under age category. Art studies the guitar with Ajarn Manoon Ploypradab in Chiang Mai and practices up to 4 hours a day, often bringing it with him to school. His parents are very proud of him. “On holidays he practices like crazy, sometimes up to eight hours a day,” his mother, Wasana Treyanurak, explained. This kind of dedication has certainly paid off and the recognition Art received in this national competition has only encouraged him to continue studying the guitar. If he keeps improving at his current rate, he very well might do just that! The Concise Oxford Dictionary of Botany describes domestication as the selective breeding by humans of plant and animal species in order to accommodate human needs. Domestication also requires considerable modification of natural ecosystems to ensure the survival of, and optimum production from, the domesticated species (e.g. the removal of competing weed species when growing cereal crops). A cat is often just bored but also needs personal attention, when it feels like it. The results of domestication include tame animals with specific useful qualities and trustworthy food sources. In this way primitive man did not have to be a hunter/gatherer any more. Domestic plants have centuries of selection and improvement before getting the qualities needed for human needs, such as bigger and better seeds or change in taste. * Easy to tame: In general, animals living naturally in groups are easier to tame than those living alone. 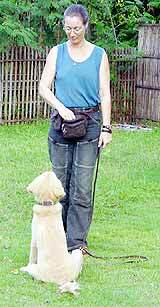 Dogs quickly recognise a human as their leader. * Acceptance of a human as its leader: Animals living in groups are used to a hierarchic system and, as a result, submit more easily to the authority of humans. A social animal like a dog will, for that reason, recognize its owner as its boss much more quickly. A solitary living cat never will. The saying goes: “a dog has a boss, a cat has servants”. * Stress resistant when living in confinement: Many animal species become stressed when confined. In many zoos you can observe stress in animals, such as the continuous pacing of big cat species in their cages. 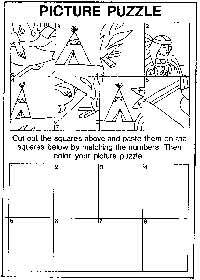 By doing this, the animal’s brain produces endorphins, which relaxes it enough to prevent it from total panicking. We can observe these stress characteristics in domestic animals too, such as the crib-biting of horses, excessive barking and destructive behavior of neglected dogs. * Easy diet: For their food intake, domesticated animals depend on what humans provide them. When the animal is a fussy eater, the care giving becomes quite difficult. For example, the Big Panda eats only a certain kind of bamboo, which is hard to get. On the other hand, goats are easy eaters (omnivores). * Ability to reproduce in confinement: Domestication is aimed at improving certain qualities in the animal over the years. For that, reproduction is needed. Therefore, reproduction is one of the most important criteria for the success of the domestication process. The Education New Zealand Trust and New Zealand Trade and Enterprise took part in the New Zealand Education Fair 2004 at Central Airport Plaza. (From left) Graeme Somerville-Ryan, project coordinator; HE Peter Rider, the New Zealand ambassador; Piyolos Ngamvilaikorn, business development manager education, and Jo McEvoy, NZ trade commissioner. Jo McEvoy, the New Zealand trade commissioner to Thailand, organized the fair in Chiang Mai on June 6 to promote further studies overseas for interested students. Stephanie Steele (2nd left), dean of international students of Auckland Girls’ Grammar School; and Karen Dorrian, (3rd left), home stay coordinator of Auckland Girls’ Grammar School. McEvoy said that different cultures, a healthy and safe environment and an affordable high standard of living made New Zealand the “perfect place” for pursuing one’s educational goals. New Zealand’s education framework has been endorsed by the Thai government. Courses are available for academic, professional and vocational studies at universities, polytechnics, colleges of education, secondary schools and private training establishments, including English language schools. 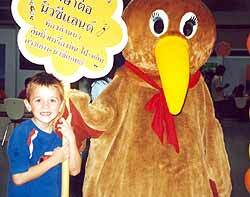 Young Peter enjoys hanging out with Kiwi, the New Zealand mascot. “Our friendship with students from Thailand goes back over 40 years. This education fair offers an opportunity for us to showcase some of our top educational institutions and show you how supportive they are of maintaining this excellent relationship which we have built over time,” she said. Further information may be obtained from the education consultants at New Zealand Trade and Enterprise on 0-2254-1610. Chiang Mai is fortunate to have an academy which seriously prepares students according to age and ability, as well as giving youngsters a chance to experience life on stage. 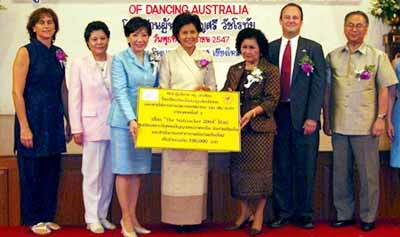 The hand-over of the 100,000 baht cheque from the Nutcracker 2004. (From left) Carol Sherman, Tamiko Shinohara, ML Preeyapun Sridhavat, Ornidda Tantipat, Tanpuying Phensri Vajarodaya, US Consul General Eric Rubin and Consul General of Japan Katsuhiro Shinohara. The Chiangmai Ballet Academy offers a full range of classes, from pre-ballet to pre-professional training. It provides an opportunity for students of all ages and abilities to study the traditions and discipline of Ballet, Jazz, Modern, Tap, National, Pointe and more. Whether a student’s goal is a career in dance or purely recreational exercise, the Academy offers personal attention and professional training. Consul General of Japan Katsuhiro Shinohara watching as the little dancers received their certificates. Classical Ballet is probably every little girl’s dream and training should, if possible, start when the student is very young. The result can be an elegant dancer who moves harmoniously. For many of these youngsters, the first step was done earlier this year when the Chiangmai Ballet Academy performed ‘The Nutcracker 2004’ at the Kad Suan Kaew theatre. The proceeds of this major Charity event, which raised 100,000 baht, were given to Ornidda Tantipat, the wife of Chiang Mai Governor who will spread it between the Northern Mentally Retarded Welfare Center, part of the Foundation for the Welfare of the Mentally Retarded of Thailand under the Royal Patronage of her Majesty the Queen and the Thai Red Cross in Chiang Mai. Arranging 250 ballerinas and VIP’s in the correct pecking order was quite a task! 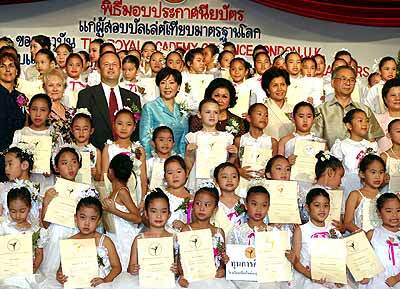 One of the aims of the Chiangmai Ballet Academy is to achieve high standards on an international level and the certificates that were presented were from The Royal Academy of Dance (UK) London and the Commonwealth Society of Teachers of Dancing from Australia. June 4 marked the date of graduation for Grace’s seniors held at the Sheraton Hotel. Grace International School had twenty-one graduates this year, the biggest class in the school’s five-year history. Senior class 2004 passes on tradition with lighted candles to the Senior class 2005. The valedictorian was Paul Cronk, a US Naval Academy appointee, and salutatorian was John Kim who will attend university in Korea. The students are heading in many directions to pursue their dreams. Many plan to attend college in the United States, such as Biola University, the US Air Force Academy, the US Naval Academy, Wheaton College as well as institutions in other countries including South Africa, Korea, Taiwan, Ireland and locally at Payap University. A dinner reception followed the presentations, which took a look back at their growing years at Grace International. The evening was capped off with a candle lighting ceremony where the graduating class of 2004 lit candles from the Juniors, symbolizing the passing of the torch to class of 2005.